Customer retention and loyalty is on the wane–and on every marketer’s brain. Consumers expect more personal, relevant and valuable brand experiences or they are quick to turn a blind eye. And that’s nothing to blink at: Each year, $41 billion is lost by U.S. companies following a bad customer experience. At the end of the day, our job is to make it easy for our customers. We want to be in the channels they want to be communicated in, where they want to buy, where their discovery of products take place, ideally in real time, with targeted, relevant messaging. To find out more about how marketers are prioritizing objectives, such as acquisition and retention, what metrics they’re focusing on and where they want to move the needle this year, Signal partnered with The CMO Club to survey a select group of CMOs from top brands. We discovered that there’s a huge disconnect between where marketers are investing their budgets and where they most need to improve. And the missing link is customer identity. 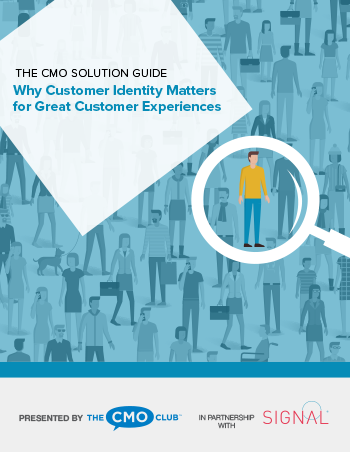 Download our special report to learn why a customer identity solution is critical to powering seamless 1:1 experiences that will reduce churn, build brand loyalty and drive lifetime value.